This group is a forum for discussing and sharing information that relates to heat pump water heaters. The group's goals are to gain alignment on a regional strategy for heat pump water heaters, address barriers, and increase consumer awareness and adoption of this technology. Additional resources and information can be found on NEEA’s Hot Water Solutions initiative website; hotwatersolultionsnw.org. NEW to the Heat Pump Water Heater Collaborative? Click on "Resources" to the left and then the "1- Orientation" folder. This folder contains some general information and overviews of the initiative. These are the slides from the NW Ductless Heat Pump Project and Hot Water Solutions Quality Assurance (QA) Webinar on March 13, 2017. These are the questions asked and addressed during the Hot Water Solutions Quality Assurance (QA) Webinar on January 20, 2016. These are the slides from the Hot Water Solutions Quality Assurance (QA) Webinar on January 20, 2016. Right now, homeowners and contractors can take advantage of two great product markdowns at retail and wholesale. 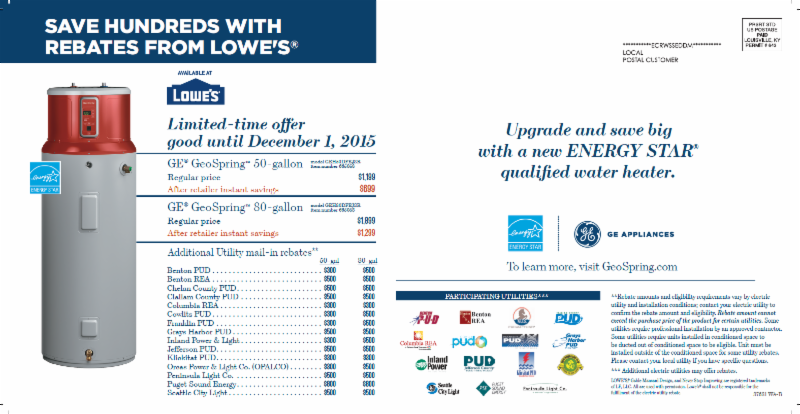 Don't miss a chance to participate in upcoming heat pump water heater retail promotions. The utility partner newsletter shares recent Smart Water Heat news, activities and resources. This presentation covers Smart Water Heat news and updates. Download presentations and other notes here. New GE model added to Northern Climate qualified products list. This is a draft report that should not be widely distributed. Formatting and content may change before it is finalized. BC Hydro | Current eNewsletter ~ Share the Newsletter! This web site is hosted by NEEA and provides some basic infromation on how HPWHs work and where to install. Comments on draft 2 of Energy Star's water heater specification. Webinar material providing an update on HPWH Northern Climate Spec revisions. Checklist to assess a heat pump water heater's compliance with the Northern Climate Specification. Summary of updates and changes on technical issues related to heat pump water heaters. Simple calculator to calculate the Northern Climate EF of a given heat pump water heater. Findings and recommendations for discussion at July 25 meeting. Presentation given by EPRI at HPWH Collaboration Workshop May 25/26 in Seattle. Notes assimilated by Julie Hayes our meeting facilitator. Presented by SNOPUD at May 25/26 HPWH Collaboration Workshop in Seattle. Presented by PSE at May 25/26 HPWH Collaboration Workshop in Seattle. Presented by PGE at May 25/26 HPWH Collaboration Workshop in Seattle. Presented by NEEA at May 25/26 HPWH Collaboration Workshop in Seattle. Presented by Tom Eckman at May 25/26 HPWH Collaboration Workshop in Seattle. Presented by BPA at May 25/26 HPWH Collaboration Workshop in Seattle. This is a brochure for a Eco-Cute HPWH made by Mayekawa. What messaging will you use to promote heat pump water heaters?